Want to send someone praise? Send this basket full of beautiful cut flowers and African violet plants, and youll make their glory greater. 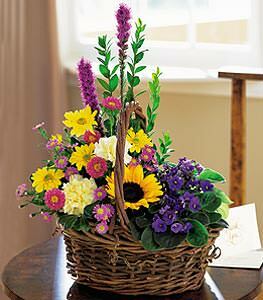 Asters, carnations, daisies, liatris and sunflowers (seasonal, otherwise gerberas), along with two purple African violet plants, are delivered in a charming wicker basket.